For eight summers, Bob Stacke has directed the band and taught percussion at the Ecole Musique Ste Trinite in Port-au-Prince and Leogane, Haiti. In addition, he spent time last summer working with percussionists at the Centre Vocationel Cite Soleil Non-Violence where they were giving music classes. Stacke is the Augsburg College music department chair and director of the Augsburg Concert Band as well as the Jazz Ensemble and Gospel Praise. Stacke shares his thoughts about the devastation caused by the recent earthquakes and photos of the people he has met while teaching in Haiti. Included in this collage are Stacke's photos of life at Holy Trinity School in Port-au-Prince, Leogane and Cite Soleil. He will also share reflections in daily chapel on Tuesday, Jan. 26 at 11:20 a.m. All are welcome to chapel. 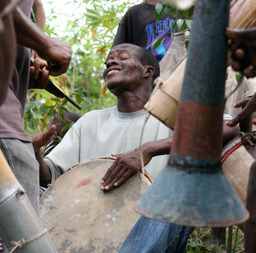 He writes, "The tragedy and devastation in Haiti are beyond my comprehension. I see news reports of thousands of bodies being bulldozed, thrown into dump trucks and buried in mass graves. I'm frightened that people I know are among them. The structures of schools where I taught for the last eight summers do not exist any more. I do not know who has survived. The day after the earthquake, I brought to my office a collage of photos I had taken of students and friends, so that I would see them as individuals and not statistics."